Chicago, IL - Using 50 pounds of military-grade TNT, the Insulating Concrete Form Association recently blasted the insulating concrete form (ICF) building system, proving the blast resistant properties of ICFs and highlighting yet another value-added feature associated with the building system. During three days of detonations, the ICFA blasted six different ICF reaction boxes at distances between 40 feet and danger-close 6 feet, using 50 pounds of military grade TNT on each blast. At each distance, the impact resistant properties of expanded polystyrene (EPS) on the face of the reaction boxes reduced the load of the blast, with the EPS compressing against the face of the reaction boxes, absorbing and reducing the load during each explosion. On the closest blast (6 feet), the 50 pound charge of TNT generated lateral forces well in excess of 10 times the weight of the box and created a ball of fire approximately 200 feet wide and 100 feet tall. Despite small cracks on the front face of the ICF wall (cracks less than 2 millimeters in width), there was no deflection, spaling of concrete or structural damage to the boxes. Additionally, the EPS was singed, a result of the close proximity of the ICF reaction boxes to the fireball created by the explosion. “This is significant. Although we look forward to performing future blast testing to control certain variables in the blast environment, these blasts demonstrations proved clients do not have to spend unlimited amounts of money on special building materials to construct blast-resistant buildings. Designed properly, ICF can be utilized to mitigate the effects during an explosive event and significantly reduce the harmful results associated with progressive collapse,” says Joseph Lyman, Executive Director of the Insulting Concrete Form Association. To ensure the ICFs showed their versatility, reaction boxes were built using standard 4000 psi concrete, a 3/8” aggregate pump mix and a 6” slump. Weighing over 26,000 pounds a piece, each box consisted of three 8’ by 8’ walls arranged in a U-shape, a 6"-thick concrete slab and a 6"-thick concrete roof. The fourth, or back, side was left open to allow for inspection of the interior after the trial. Additionally, all the boxes were reinforced with #4 steel reinforcement bars on 16” center, and three boxes were further reinforced with structural fibers. 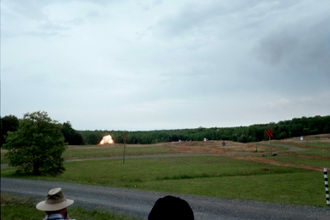 The blasts were performed in conjunction with ICFA’s participation in the Force Protection Equipment Demonstration (FPED IV) May 6, 7, and 8, 2003, at Quantico Marine Corps Base. FPED is sponsored by the United States Military’s Joint Staff, as well as the Department of Defense, the Department of Energy, the National Institute of Justice, and the Transportation Security Administration, and allows generals, government procurement officers and chief decision makers the opportunity to view the latest commercial off-the-shelf (COTS) products related to force protection and anti-terrorism. 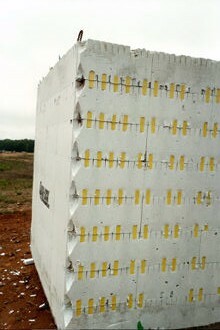 “FPED IV offered the opportunity to test a minimally reinforced ICF wall under “blast” loading. 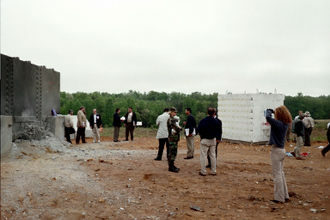 At FPED III (2001) a wall with 2x4 studs was tested with a 50 pound TNT charge at 35 feet - the wall was destroyed. At FPED IV, an ICF wall was tested with a 50 pound charge at 6 feet - there was only minor cracking in the wall. We were encouraged by the results of this demonstration and are hoping for incorporation of this economically robust wall system on future projects,” says Steven Baldridge, P.E., S.E., President of Baldridge and Associates and ICF designer for the FPED project. In addition to the association’s primary purpose of demonstrating the effectiveness of ICFs as a blast mitigation building material, it allowed the ICFA to partner with the Northern Virginia Concrete Promotion Council as an active participant in the demonstration. “The NVCAC is pleased with the alliance it has built with the ICFA, and the opportunities it offers in promoting the use of poured concrete in vertical building systems. We look forward to our partnership with the ICFA as we begin penetrating military and federal markets,” says Dave Snider of Virginia Concrete. The Insulating Concrete Form Association (ICFA) is the business trade association of the insulating concrete form industry, representing over 400 international firms through ICF promotion, codes and standards, research, partnering and education. Founded in 1994, the ICFA is located in Suburban Chicago, IL.